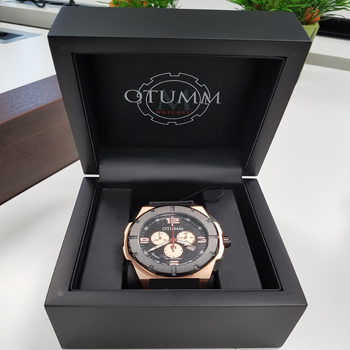 Because we sell OTUMM watches, we regularly receive questions about these watches, especially about the quality. Of course, we would like to answer all off your questions and therefore we have also made this OTUMM Speed II review so that all of your questions will be answered by reading this, or watching the video. When you open the lid, immediately you see the box in which the watch is located. You can already feel that the box is quite heavy, because the box in which is wthe watch, has been made of neatly finished wood. 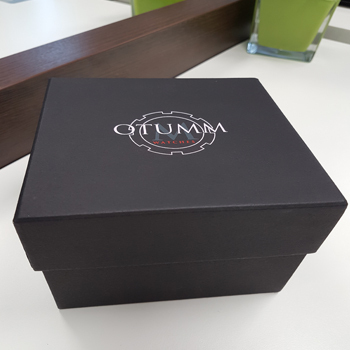 When you open the lid, you'll see the watch, which is neatly in a protective plastic package and rests on a soft pad, the top of the box is also protected with soft material (with the OTUMM logo on it) and this ensures that the lid of the box can’t damage the watch. 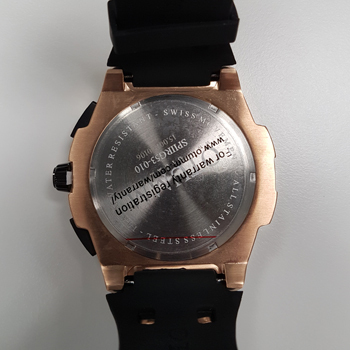 In the box you will also see a plastic card, this card is the receipt, where you can put the purchase date and the serial number of the watch. The ticket entitles you to a 2 years Warranty. We are now coming to the point about the watch. The watch is placed on a pad that is stuck in a soft material to protect the watch, so it’s very wise to keep the box so that you can store the watch in the box so that it has a safe place when you don’t wear it. 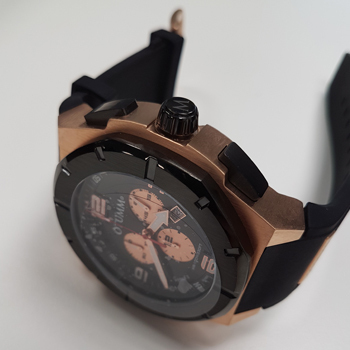 The case is made of stainless steel, the case of this watch has the color of rose gold, both of them are made of brushed steel, resulting in a matt shine. The case looks very sturdy and robust, so the watch feels quite heavy, it feels very good and of good quality. The case of this watch has a diameter of 53mm, which is the biggest size. Speed II watches are available with a diameter of 53mm and 45mm. The glass is made of mineral glass, which is processed with a scratch-resistant coating, although in practice it appears that it needs to be treated calmly and economically, so there will be no scratch with small touches, but it does not mean that It's 100% scratch resistant. The dial in this watch is black, with rose gold chrono dials. The dial is a dial that you can expect from OTUMM and is therefore also really in the style that OTUMM uses in most watches. The watch features a date indication, a small second counter, a 30-minute counter and a 12-hour counter and features a center stop second. The watch is the heart of your watch and it is therefore very important that this is very good. The clock is from the Swiss brand Ronda and is a Quartz clock (powered by a battery). Ronda watches are known as very good and are of course Swiss made. With the watch you can also swim, it is waterproof up to a depth of 100m and can handle a pressure of 10bar. So you can swim and shower easily. Although the watch is waterproof, I will avoid water as much as possible, simply because it can always affect the steel and watchband, especially when swimming in swimming pools, due to the fact that swimming pools are kept clean by means of chemicals. If you really are a big fan of big oversized watches, then an OTUMM Speed II is perfect for you, especially the 53mm diameter model. The 45mm diameter models are a lot less wide and ideal when your 53mm is really big. Wearing big watches always takes time to get used to it, but what struck me while wearing this watch is that the watch on the side is quite tight, because of the size of this watch, I had to do the watch a bit higher than usual, because the buttons came to my hand differently, which I did not really like. In addition, the watch is fine and comfortable and the size isn’t really disturbing, but I think it's better to wear the watch a bit higher than usual, but this can also be purely personal. We randomly caught a watch from the collection and assume that the rest of this collection is the same. 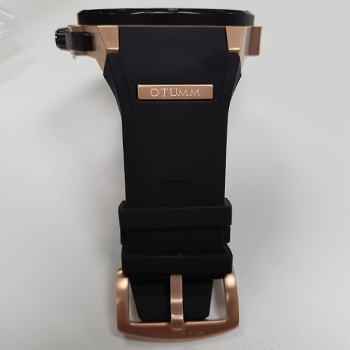 We always think OTUMM has very nice watches and that's also the case with the OTUMM Speed II. We especially like the choice of the watchwork, this really gives the watch a very good value for money (advisory fee € 329). We also find the case very robust, heavy and firm, just as it looks. Especially because of these points we find very good watches with a good price / quality ratio, and they are also very well packed and have a 2 year warranty. In short, very good watches for a decent and great price!